Until this summer, I knew two things about Michigan: The state had some of the most Instagrammable lakes in the country and it’s home to Mackinac Island. Two good points, but there’s more to explore in the state. If you’re ready to road trip through Michigan, but have no idea where to begin, this post is for you. This itinerary covers a little more than a week of exploring mostly the Lower Peninsula. The Upper Peninsula is going to be a trip in itself someday. Read my Michigan Bucket List to see what’s missing from this trip. Disclosure: A portion of our stays and experiences were sponsored by convention and visitor bureaus and hotels. Many of our experiences were paid out of pocket, too. All thoughts, opinions and typos are my own. 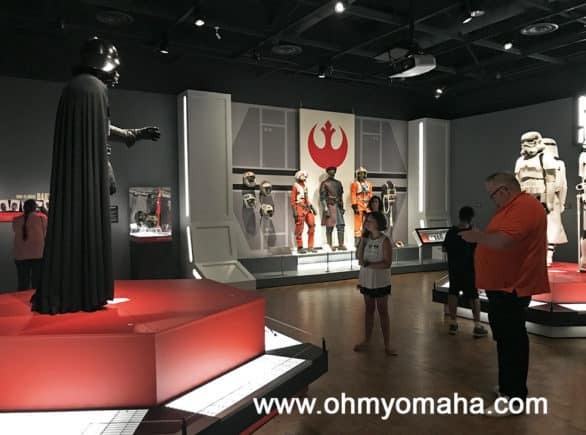 What I loved about this road trip is that it provided a chance for city exploring with wonderful museums and restaurants, as well as plenty of outdoor adventures. And beaches, we got plenty of beach time. 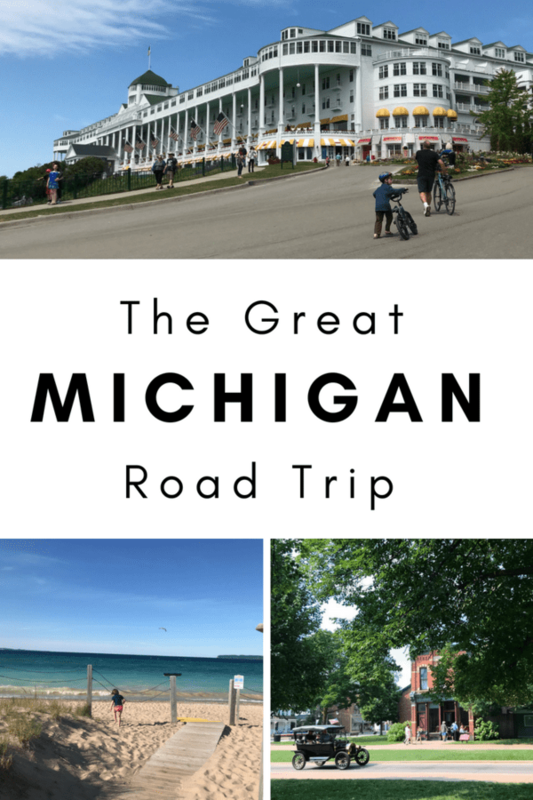 The places we visited were (in order of stops): Grand Rapids, Ludington State Park, Traverse City, Petoskey, Allanson, Mackinac Island, Frankenmuth, and Detroit. Lakeside parking in Michigan. 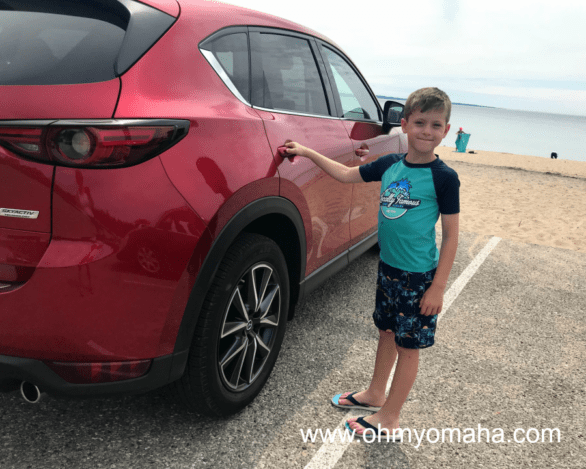 Traveling nearly 1,000 miles was pretty comfortable in the Mazda CX-5 Grand Touring. We were fortunate to partner with Mazda for this road trip! The 2018 Mazda CX-5 Grand Touring AWD was a comfortable fit for our family of four. In case you were wondering, we did not drive from Nebraska to Michigan. We took a direct flight from Omaha to Detroit. 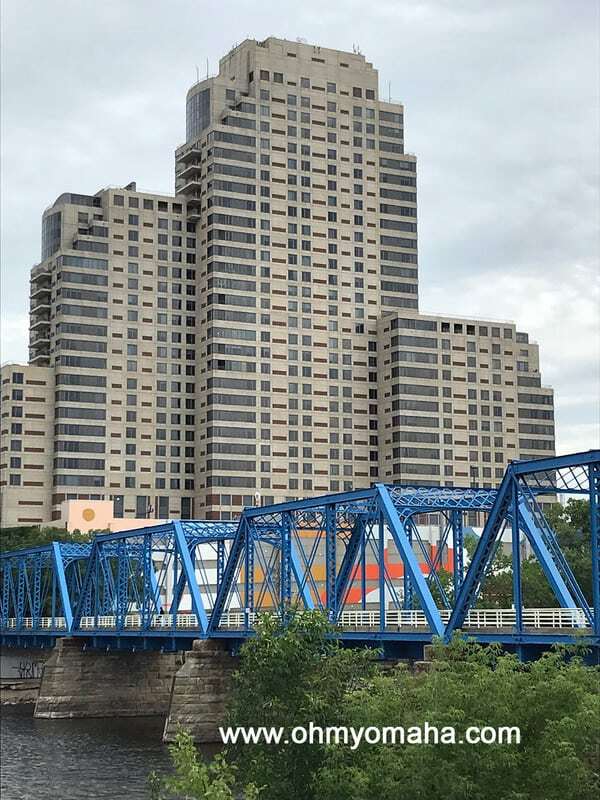 We spent two days exploring Grand Rapids. 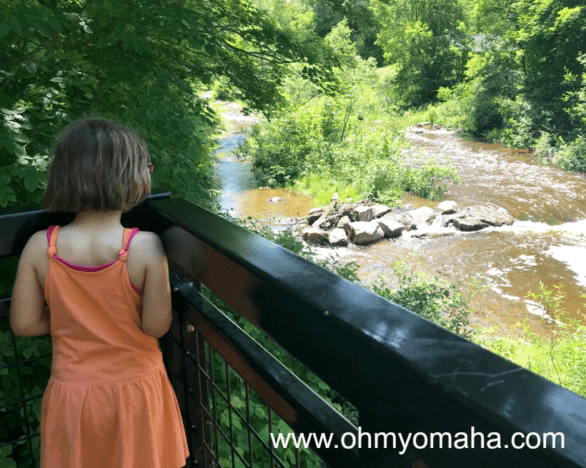 The highlights included the John Ball Zoo and Grand Rapids Public Museum (which we did not leave nearly enough time to fully explore). If you go to the zoo, you can pay a little extra to do a ropes course or zipline through the zoo. 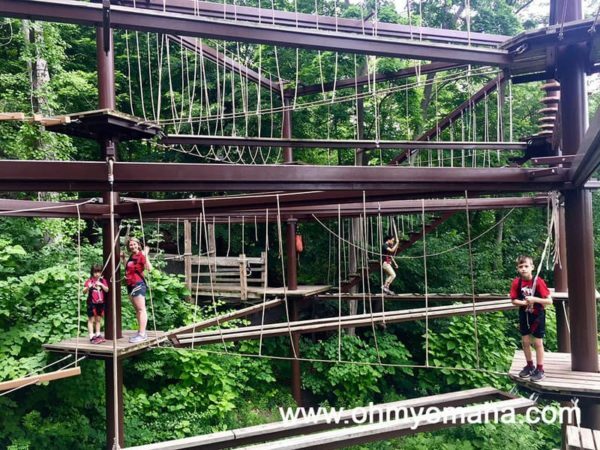 My whole family did the ropes course at John Ball Zoo in Grand Rapids. My youngest was 6 years old and decided it wasn’t as fun as she thought it would be. 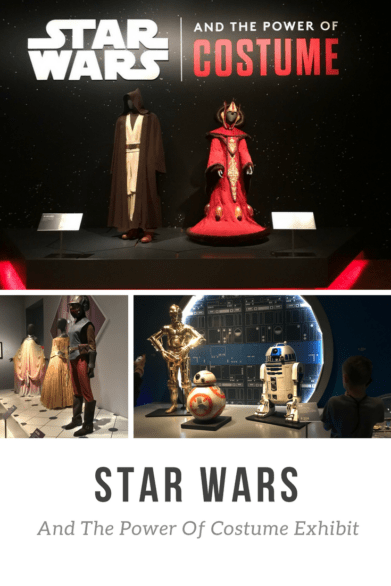 Since our kids are still pretty young, we also visited the Grand Rapids Children’s Museum. 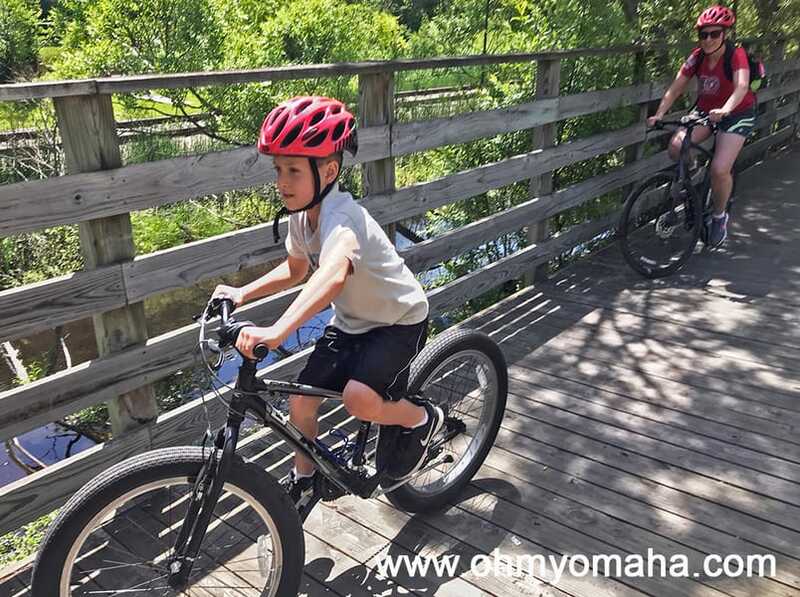 If your kids are younger than age 8, I’d say it’s good to include on your itinerary. Where to eat: Grand Rapids is known as Beer City, U.S.A., so I thought it was pretty necessary to find one that was family-friendly just so I could be a part of that scene. Since we were staying downtown, the Grand Rapids Brewing Co. was an easy walk from our hotel. There were several families there, and while they didn’t have a kid’s menu, they did adapt the regular menu to our kids’ preferences (no fancy stuff in the mac and cheese, please). Chez Olga was in Eastown in Grand Rapids. The restaurant serves Caribbean food. We had dinner in a very unique restaurant called Chez Olga. 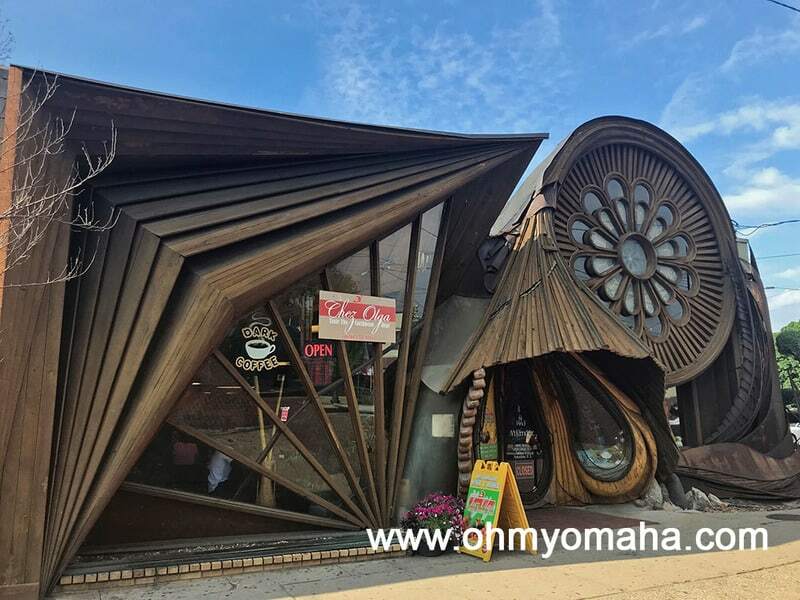 While my kids were less than enthused by the flavorful Caribbean cuisine (it was SO good), they did like the unique look of the building. I wish we had more time to explore the neighborhood it was in. 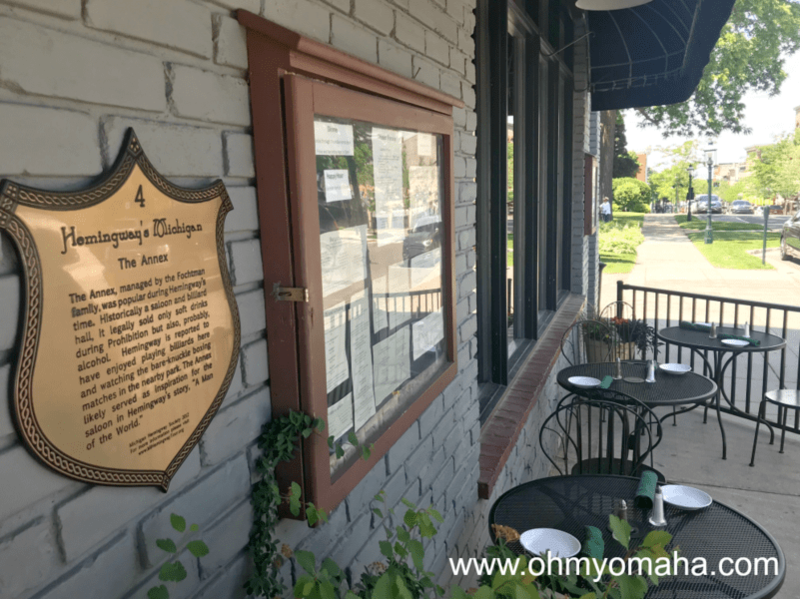 It was near the yummiest place for breakfast, too – Wolfgang’s. Another great restaurant for breakfast is Anna’s. There was quite a bit of a wait because we had a late start to the morning. However, once seated, the service was quick. 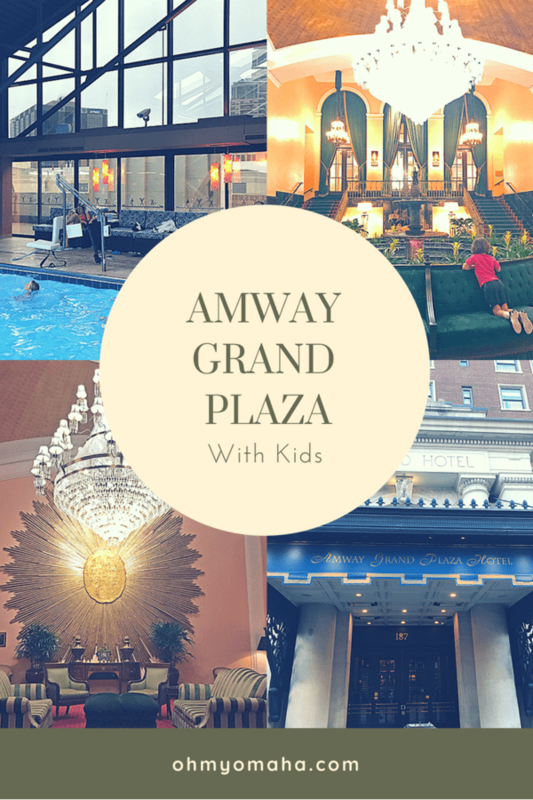 Where to stay: The Amway Grand Plaza in downtown Grand Rapids was a combo of great location and great amenities. 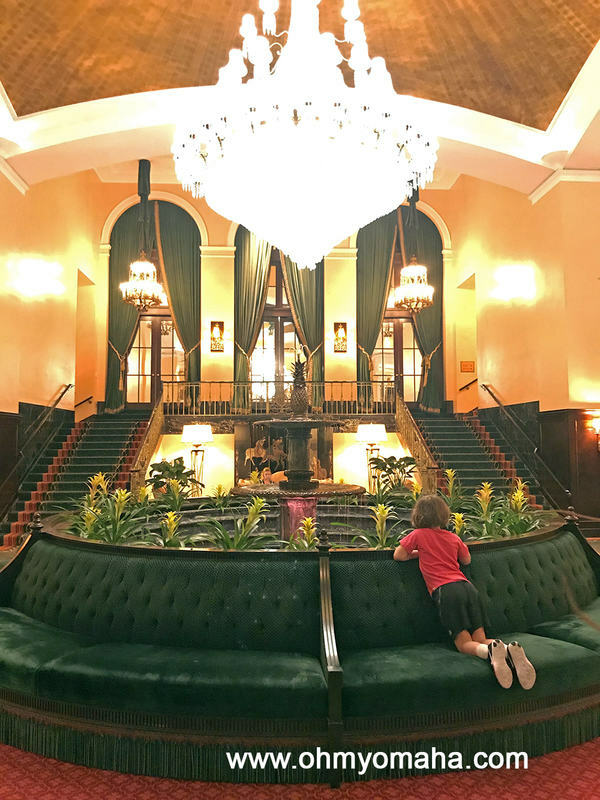 This hotel has a historic side with charming lobby and a modern side with a huge tower and family-friendly pool. 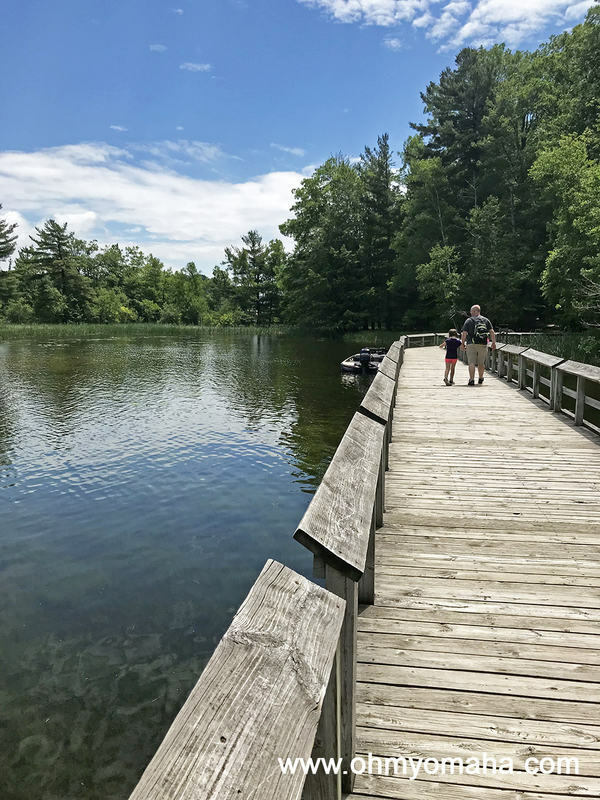 Our next overnight destination was Traverse City, but on the way there, we decided to enjoy a pit stop at Ludington State Park. Part of our hike around Lost Lake passed by campgrounds and a dock. We enjoyed an easy hike around Lost Lake, taking a dip in the cold water about half-way. This park could easily be an overnighter (or two) for families. If you want to swim in Lake Michigan, this has the beach you’re looking for (though the water was very cold when we were there in June). The beach by Lake Michigan Beach House is expansive. Traverse City was our next stop, and we planned two days to explore the area. We ended up spending a lot more time around the hotel because of the view. Sunset at Cherry Tree Inn & Suites in Traverse City, Michigan. 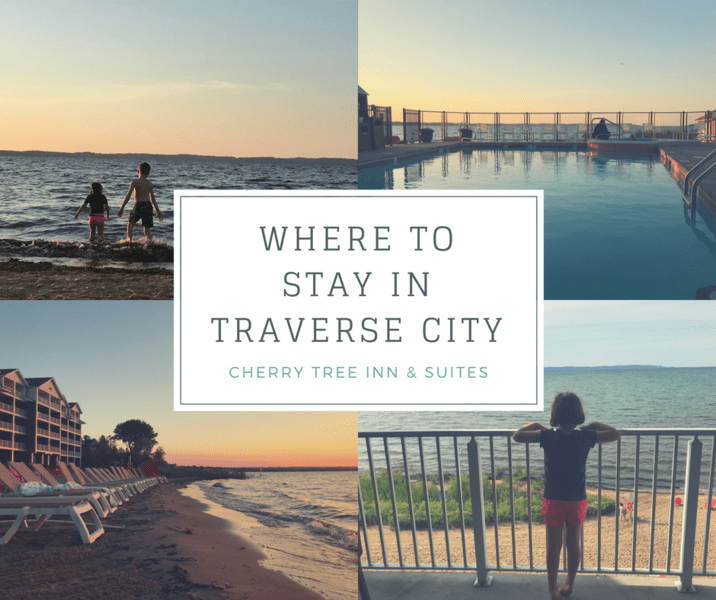 Where to stay: Our hotel, Cherry Tree Inn & Suites, sits right on Grand Traverse Bay, and between the waves, the outdoor pool, and the pirate ship play set, our kids didn’t want to leave. We biked along the T.A.R.T. in Traverse City. 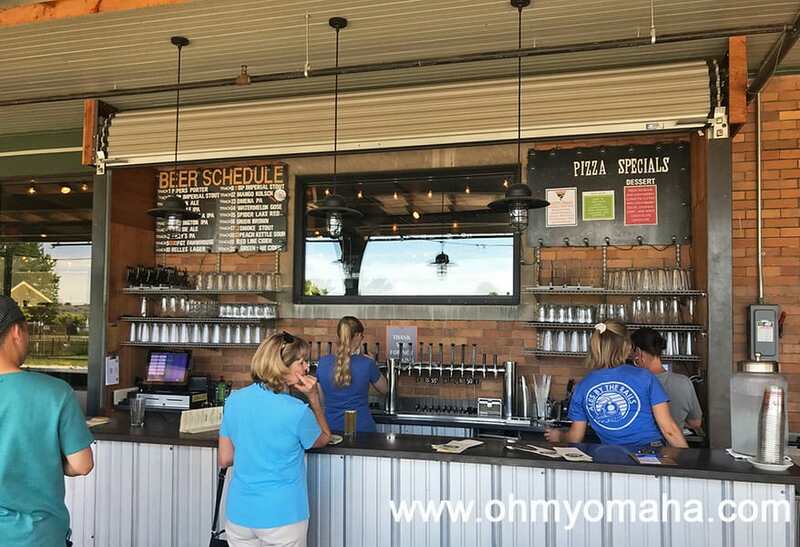 There’s a great, family-friendly brewery known for its pizza on the route called The Filling Station. There’s a trails system in Traverse City called the T.A.R.T. and it’s not far from our hotel. We walked to a bike rental shop, and then hopped on the trail. It did cross over some city streets, so I’m glad our youngest was on a tagalong bike. The view of Lake Michigan from atop a 450-foot sand dune at Sleeping Bear National Lakeshore. We also took a little side trip to Sleeping Bear National Lakeshore. We allotted just enough time to climb a dune and take the scenic drive through the park. If you have more time, plan for more of it, because it is a gorgeous, scenic lakeshore. Glen Haven Beach is picturesque but when we visited, the water was freezing cold and the waves were high (for a lake). The kids really wanted some lake time while we were there, but the lake itself isn’t that accessible inside Sleeping Bear (unless you’re willing to deal with climbing back up a 450-foot sand dune). Instead, we drove just a few miles away to Glen Haven Beach on Sleeping Bear Bay. The water was extremely cold and the waves were high. But the kids got their chance to play in the water. Where to eat: During our T.A.R.T bike ride, we stopped at The Filling Station Microbrewery for lunch. They’re known for pizza, and for having a family-friendly atmosphere – there are little sand boxes set up for kids. The beer was good too. Food and drinks were ordered at the Filling Station’s outdoor bar. The family-friendly brewery/restaurant was located along the T.A.R.T. Trail in Traverse City. The most memorable meal was at 7 Monks Taproom in charming downtown Traverse City (we did a little shopping before sitting for dinner). Even as a taproom, it’s a very family-friendly place with a kids menu. My husband ordered a burger that he says is a serious contender for the best hamburger ever. We stuck to the complimentary breakfast provided at the hotel. It was nothing special, but it was quick and convenient. 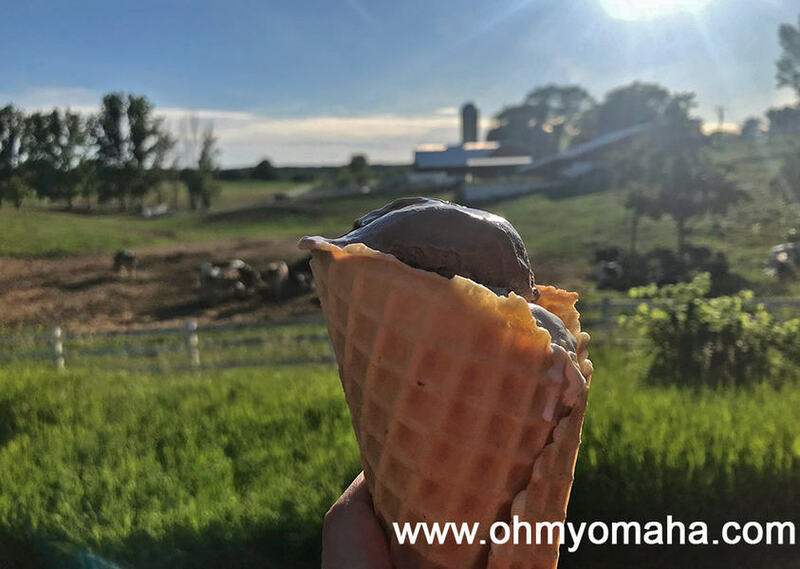 You can enjoy Moomers ice cream while looking at dairy cows in the distance. A trip to Traverse City is incomplete without a stop at the famous Moomer’s, an ice cream shop located on a dairy farm. We went there after our afternoon at Sleeping Bear National Lakeshore. Our route to Petoskey along US-31 was dotted with roadside food stands, and on impulse, we stopped at one offering freshly-picked strawberries and strawberry donuts. 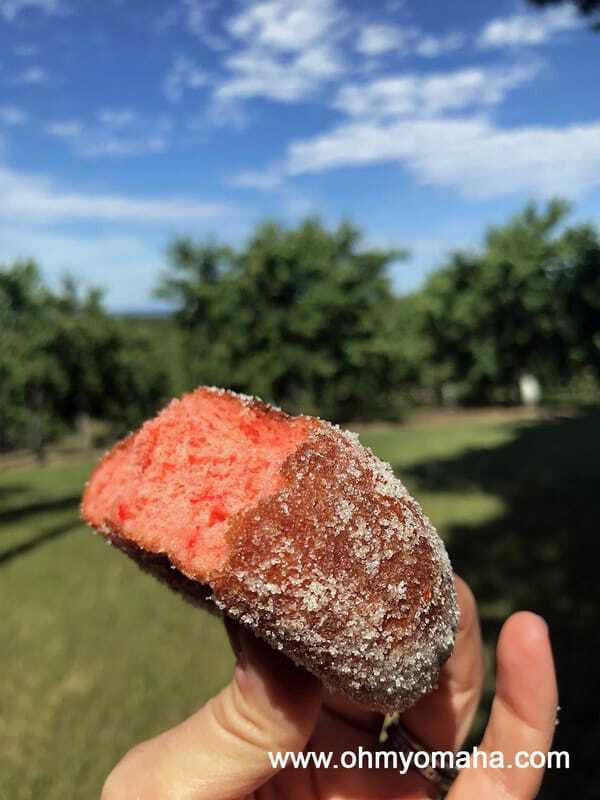 A fresh strawberry donut from a Michigan farm stand. Properly fueled for the rest of the trip, we arrived in Petoskey in time for lunch. After a brief walk along the bay, we walked to the picturesque downtown area to find our next stop: City Park Grill. The City Park Grill is an old Hemingway haunt in Petoskey, Michigan. He usually sat in the second seat from the end of the bar. Where to eat: Petoskey boasts connections to Ernest Hemingway, so I wanted to dine where Hemingway once drank. If you go to City Park Grill, you can actually sit in the same barstool as Hemingway. I was with my family, so we got a dinner table, but it was tempting. 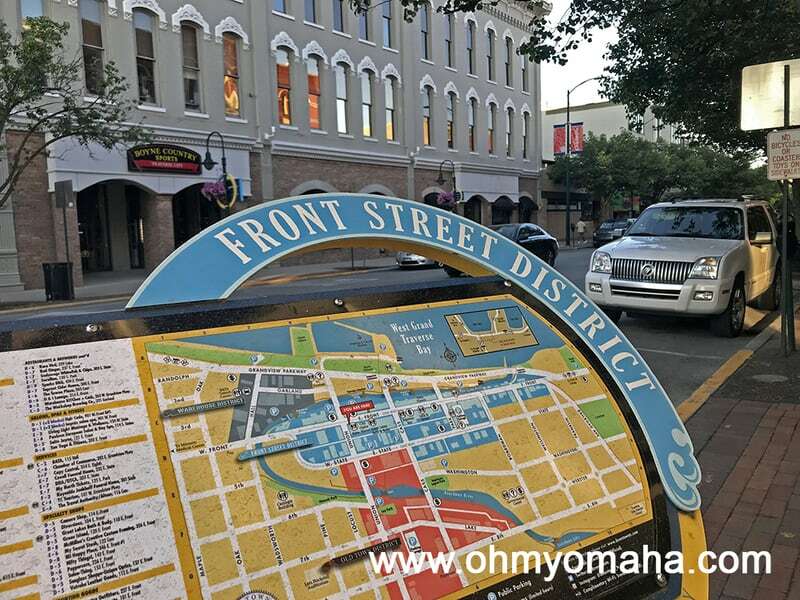 We walked around the downtown area afterward, stopping in a bookstore and then venturing to a trail for a quick walk. 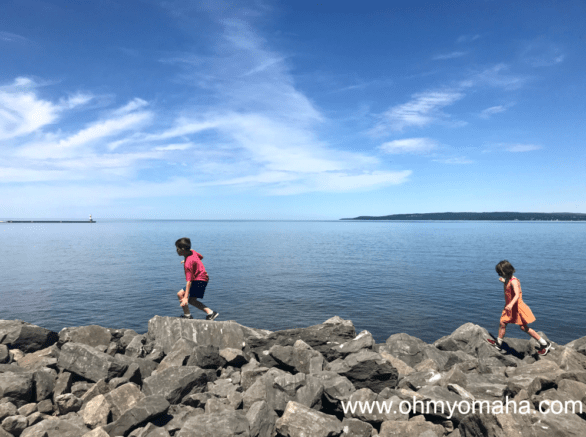 The kids were preoccupied by a quest to find Petoskey stones, we so left the small town and headed to Petoskey State Park to search for them. My son’s rock collection from Petoskey State Park. The two rocks on the far right are Petoskey stones, which are fossilized coral known in the area. We lucked out and found a few small ones at the state park. The water was very cold, so there was no actual swimming at the lake. Petoskey Brewing Co. is near Petoskey State Park, so once we left the park, we headed there for a late afternoon snack. They have tasty little ice cream bars the kids liked, and the beers were refreshing for the adults. Dusk at Stafford’s Crooked River Lodge in northern Michigan. Shortly after I took this picture, staff made a fire in the hotel’s fire pit. 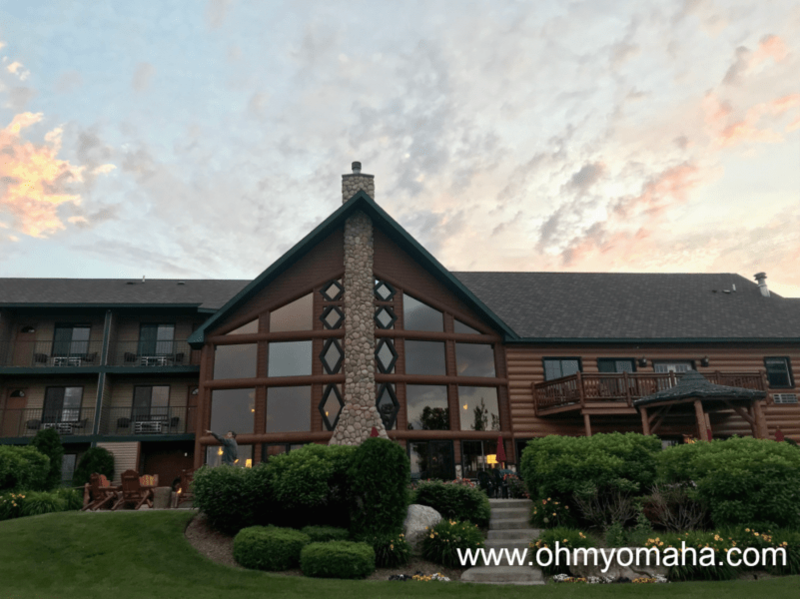 Where to stay: We stayed one night in the Petoskey area, in a lodge on a river called Stafford’s Crooked River Lodge & Suites. It’s a short drive from Petoskey, and feels a world away. The spacious suite was great, though we wanted to spend as much time as possible at the pool and, later, outside. Our only stop in the Upper Peninsula was on the tiny, car-free island of Mackinac Island. We had only 24 hours to explore it, and while that was sufficient time, it was so idyllic that we wished we had more nights to stay. 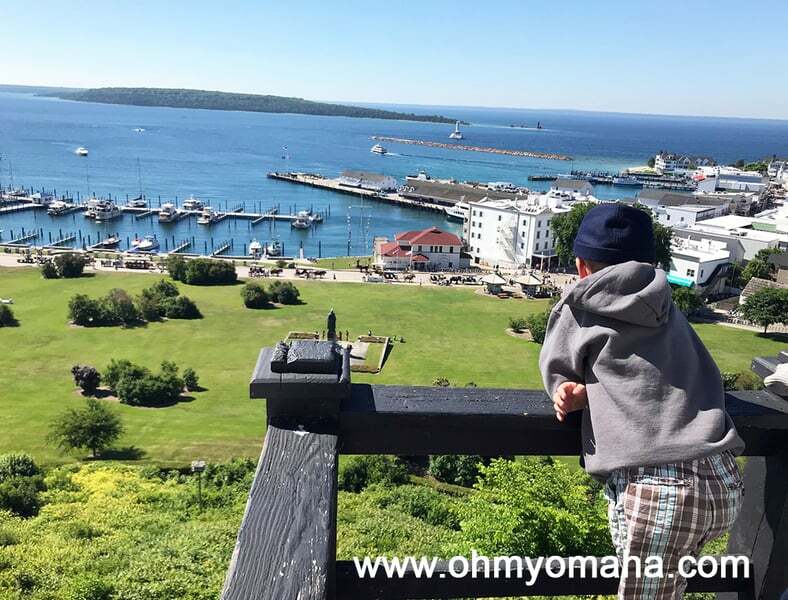 Soaking up the view of Mackinac Island while at Fort Mackinac. To get to the island, most people travel by ferry. Time it right and your ferry may take you up close to the iconic Mackinac Bridge. The best way to see the island, if you’re an active family, is by bike. It’s flat, the trail is wide, and you can’t beat the views. We also spent time at the massive pool at the Grand Hotel, and had a very memorable experience at Fort Mackinac – we helped fire a cannon! 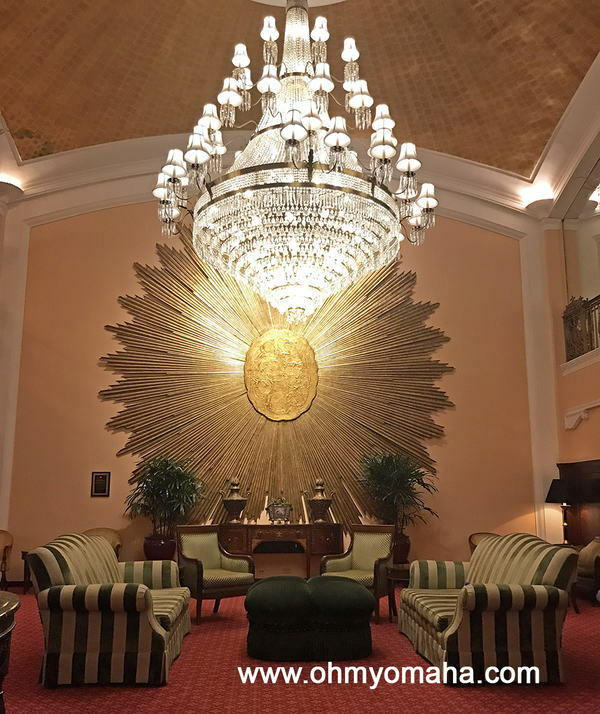 Where to eat: Our best dining experiences were at Grand Hotel restaurants (though we didn’t try the famous lunch buffet). Breakfast was a multi-course affair with multiple options to order, or a buffet to indulge in. Dinner was even more special – five courses, dress code enforced, and live music. The kids loved it – and they had a children’s menu. Sadie’s Ice Cream Parlor had its own entrance in the Grand Hotel. We had sweets while we were there, of course, There are several fudge shops to choose from on Mackinac Island, so you should try their famous fudge. Ice cream was also in order, so after our morning at Fort Mackinac, we walked back to Grand Hotel to have some cone at Sadie’s Ice Cream Parlor. The kids earned their free cones by completing a kid’s fitness program. Speaking of Fort Mackinac, Grand Hotel runs a little cafe there. The view is astounding, and while we only had coffee and hot cocoa, it was a memorable experience. The street that leads to the Grand Hotel on Mackinac Island. Where to stay: The most famous hotel on the island is the historic Grand Hotel. We were fortunate to stay this all-inclusive resort. There’s plenty to do there for the entire family, from complimentary lawn games and kid’s programs, to more elaborate affairs like afternoon tea. 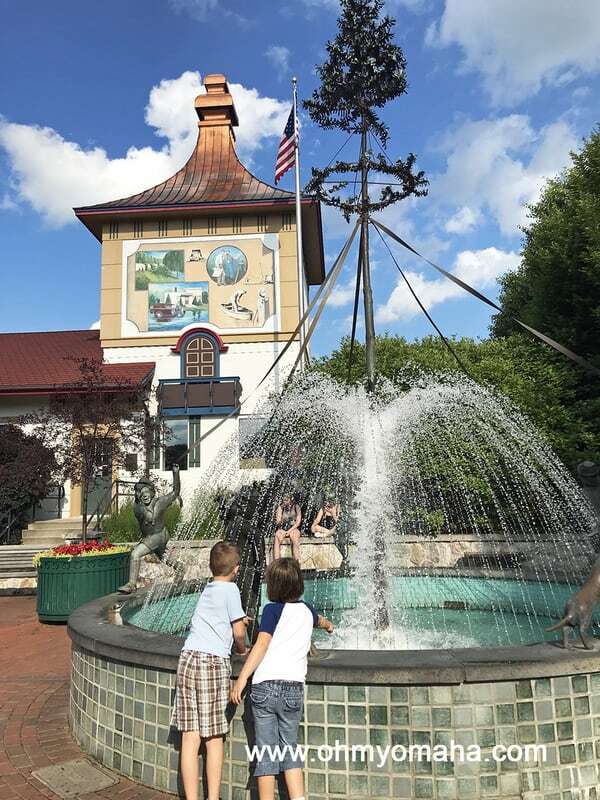 The plan was to make a lengthy pitstop in the very German town of Frankenmuth, located on our route between Mackinac Island and Detroit. We’d dine on some must-try fried chicken I’d heard about and we’d enjoy some German beer. Frankenmuth was a town in Michigan that felt more like a German village. However, we had a bit of a family medical emergency. So, while I strolled along one of the main thoroughfares with the kids, my husband visited their minor medical center. Our final stop was Detroit – a large city that that needs a few days to explore. 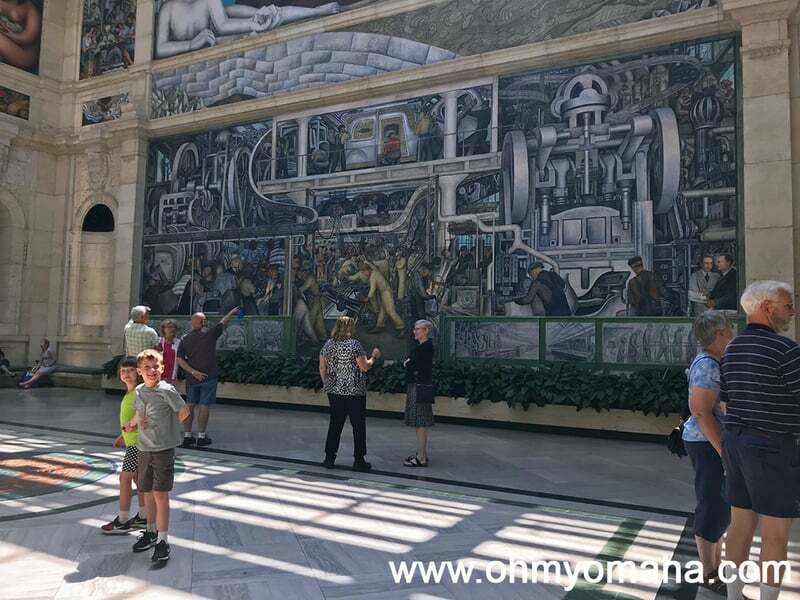 The frescoes by Diego Rivera are one the highlights of the Detroit Institute of Arts. My kids stood still for about 5 seconds to let me admire them. 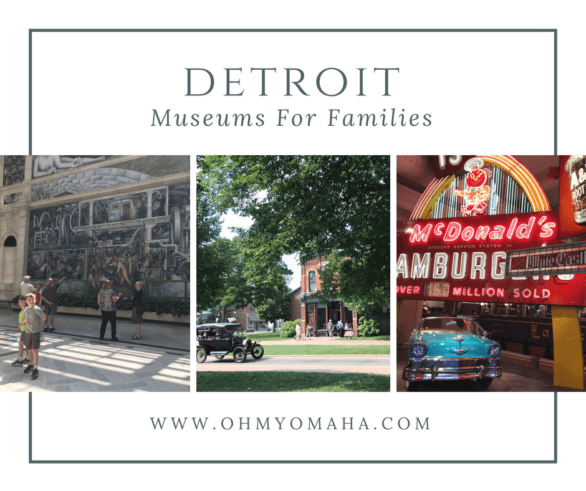 Given the oppressive heat of June, we stayed indoors mostly, visiting great museums like the Detroit Institute of Arts, The Motown Museum, and the Michigan Science Center. 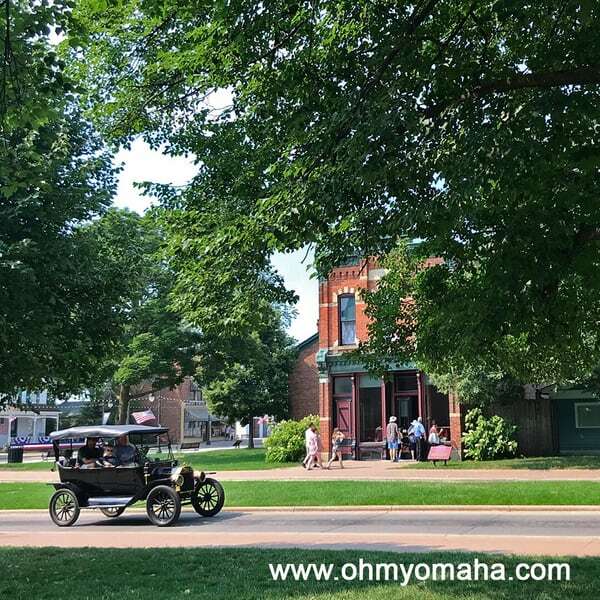 I loved the picturesque Main Street at Greenfield Village. Guests can pay a little extra to ride around in in a Model T.
We also spent a full day at The Henry Ford, with just a couple early morning hours at Greenfield Village. Both could be a day in themselves. Both were big hits with the kids. Where to stay: Detroit is sprawling and you have an abundance of choices. 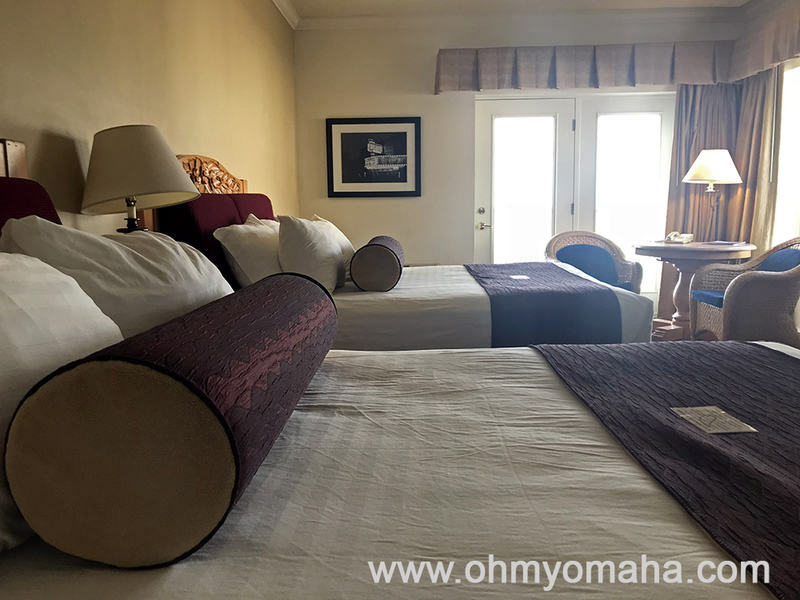 The place we stayed at is in Troy, Mich., a Fairfield Inn & Suites nicely located near the interstate, and a convenient drive to Beaumont Hospital (long story). Frankly, though, it would not be best for visiting all of the key Detroit attractions. 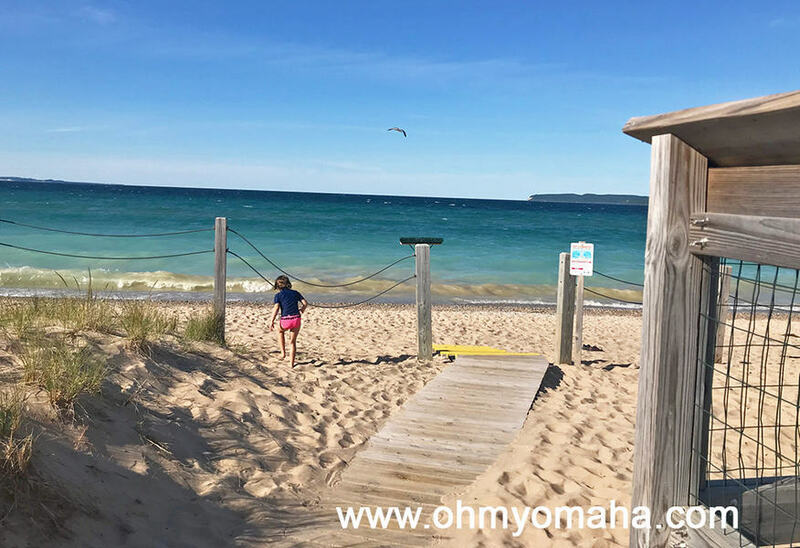 We had two days to explore Traverse City, Mich., this summer. 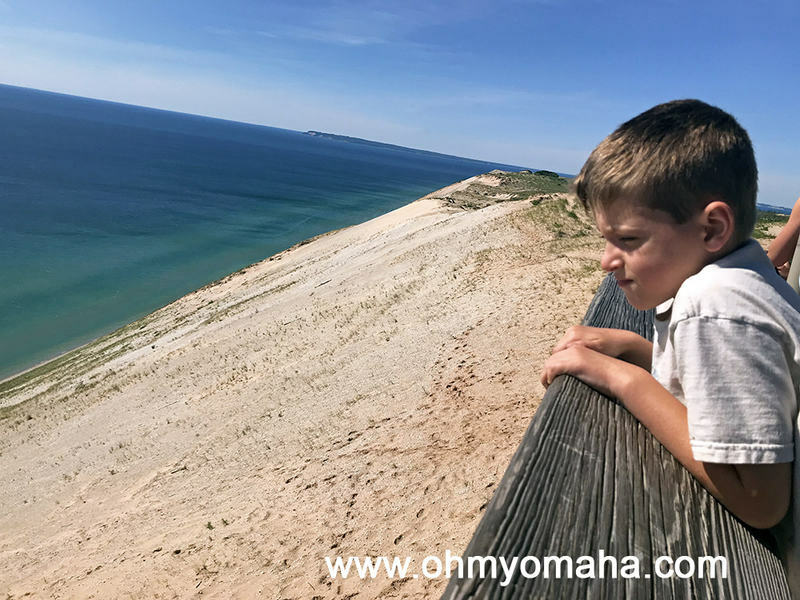 The itinerary included dune climbing, drinking craft beer, and gazing dreamily at lakes (that last two things were just on my schedule – the kids had other plans). Given what we wanted to do, we wanted to find a hotel in Traverse City that got us close to the water but still had a convenient location. Since we loved the idea of a place with a view, we ended up at at Cherry Tree Inn & Suites in Traverse City. What a view! Disclosure: Our stay was hosted by Visit Traverse City. All thoughts, opinions and typos are my own. Cherry Tree Inn & Suites has a lot going for it: Private beach, themed play set, and an outdoor pool. Plus, their complimentary shuttle takes you all over the city (though, really, it’s pretty easy to navigate on your own). 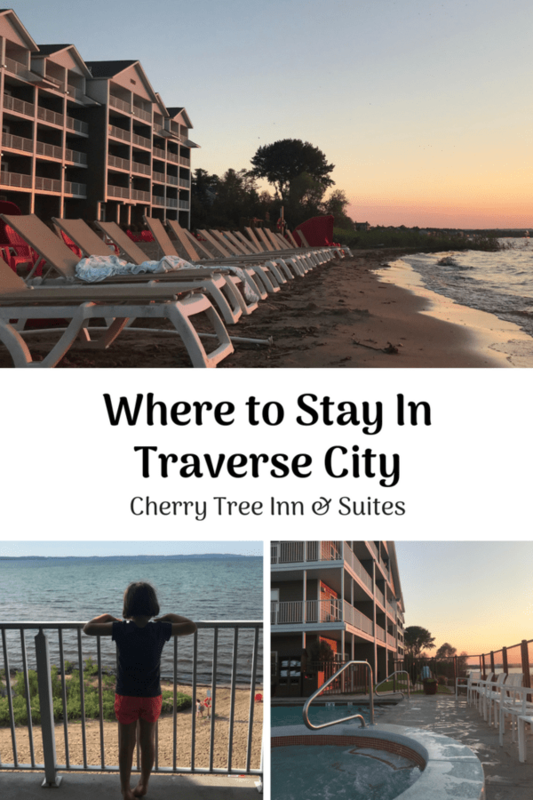 There are more than 20 room and suite options at Cherry Tree Inn & Suites in Traverse City. Our room had two queen-size beds, a little kitchenette with fridge, and a balcony. The hotel has several different room options. Whatever you pick, request water view. I spent more mornings on the balcony writing and watching the sunrise. And the sunset view was lovely too, though, it’s better to be down on the beach for them, in my opinion. Cherry Tree is located in a touristy strip of hotels on one side of the street, while on the other side, you’ve got chain restaurants, putt putt, and gas stations. We did find a bike rental shop within walking distance of our hotel, making for an easy bike ride excursion with the kids. A complimentary hot breakfast at a hotel is always a nice amenity. It wasn’t the best complimentary breakfasts I ever ad, but it got the job done. The hotel has a complimentary hot breakfast, as well as a little sweet shop where you can buy candy and pints of Moomers. Moomers, if you haven’t read about it, is a very well-known ice cream shop in Traverse City. I recommend going there since it is on a picturesque dairy farm, but if you can’t, might as well buy the ice cream at your hotel, right? They rope kids in with cookies on the counter and then from that point on, they have made fans of your kids. 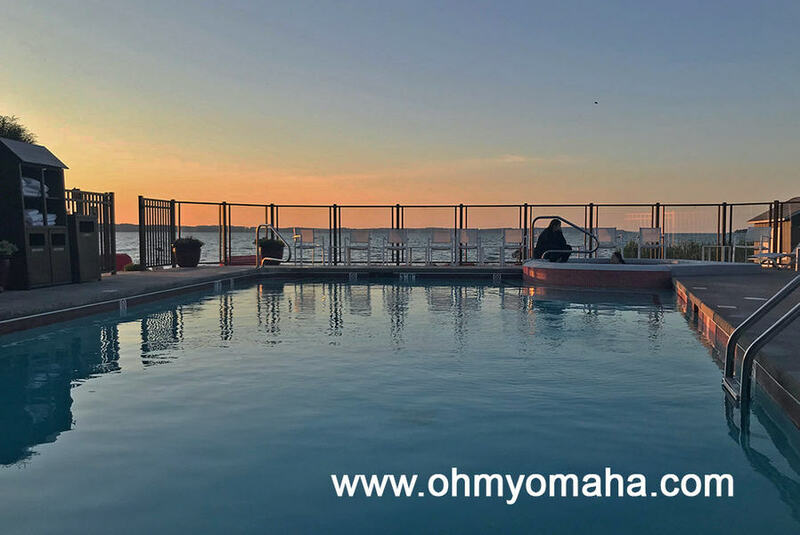 The Cherry Tree Inn & Suites’ outdoor pool and hot tub had a nice view of the bay. My kids preferred it to the indoor pool. The biggest hits for my kids were obviously the pools – one indoors and one outdoors. The outdoor hot tub is nice, too, especially at sunset. The the second popular spot to find kids is on the pirate ship swing set. 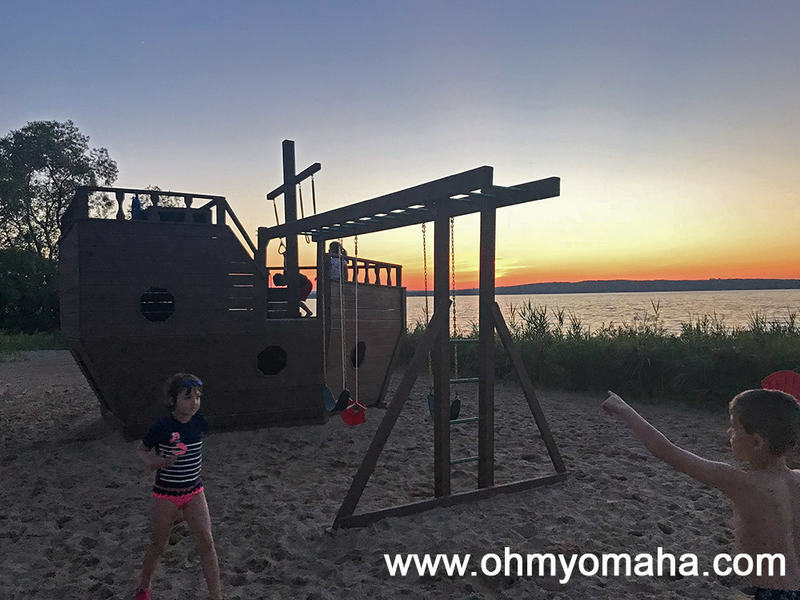 Cherry Tree Inn & Suites has a pirate ship playground on its private beach. 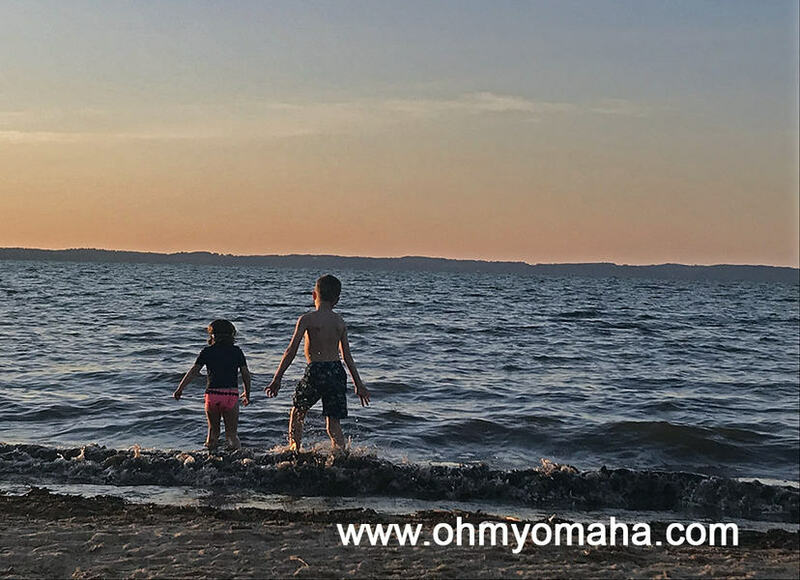 The kids attempted to play in the lake, but it was not the best experience. The water was cold and full of weeds that creeped the kids out. Cherry Tree Inn & Suites has a private beach. It’s not bad for playing in the sand, but my kids weren’t fans of the water. Too much seaweed, they tell me. 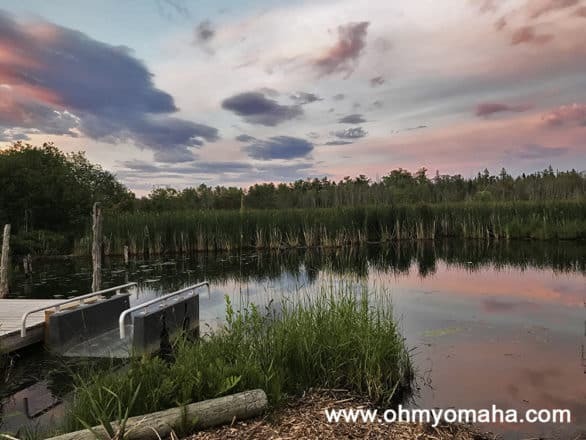 If we had more time, we would’ve considered renting some watercraft, which is available on the property (for a bit of a hefty price, though). If you have older kids, try staying up late for the bonfire each night. 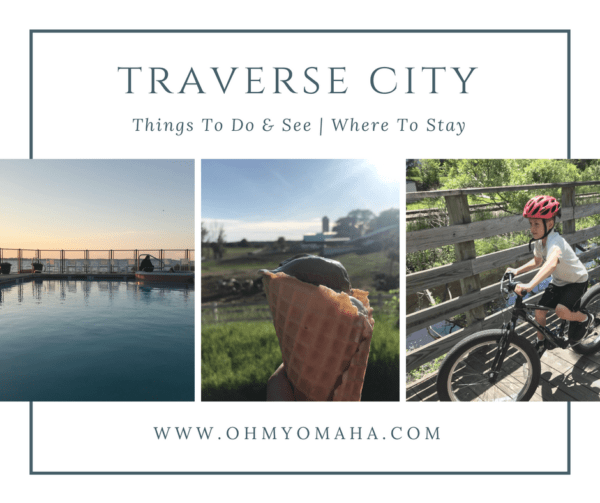 Read up on our two days in Traverse City for a list of things my family did while visiting Traverse City. The closest thing on that list (besides the private hotel beach), was ride bikes on the nearby trail. From the hotel, you’re also within walking distance of Pirate Cove Adventure Park, which has putt putt, bumper boats and that sort of thing. 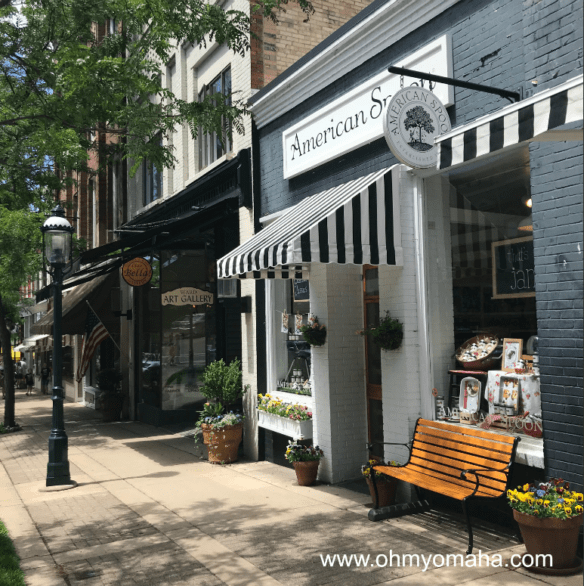 Front Street and the surrounding streets were my favorite places to window shop in Traverse City. Besides restaurants, the shops were almost all closed when we visited one evening. 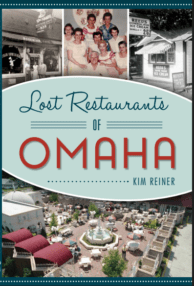 For food, I’d recommend heading downtown for great dining and breweries. I talk about restaurants, breweries and the best place to get ice cream this post. Where: 2345 U.S. 31 North, Traverse City, Mich. I started planning this vacation in the form of a bucket list. 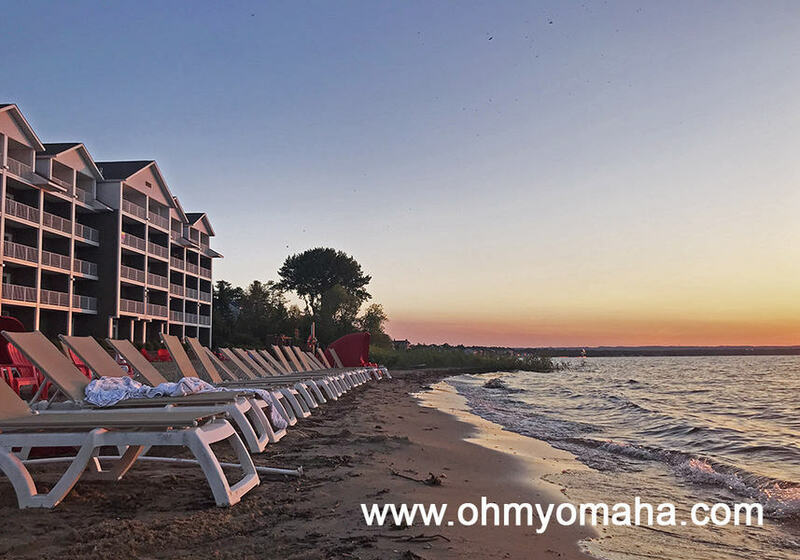 Check out the Traverse City Bucket List to begin your plans. This stop was part of a larger road trip through Michigan. 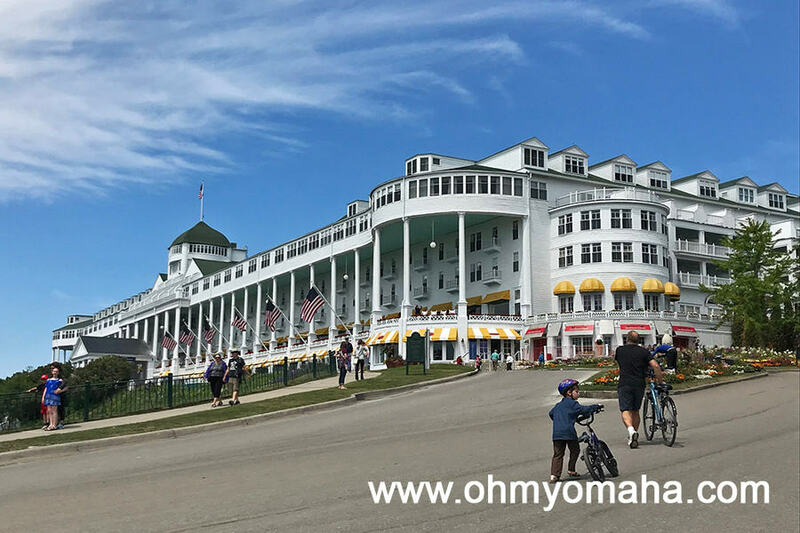 Mackinac Island was one of our favorite stops on our Great Michigan Road Trip. There’s much to love about Mackinac Island–there’s natural beauty and zero cars. It’s a fun family vacation destination steeped with military history. 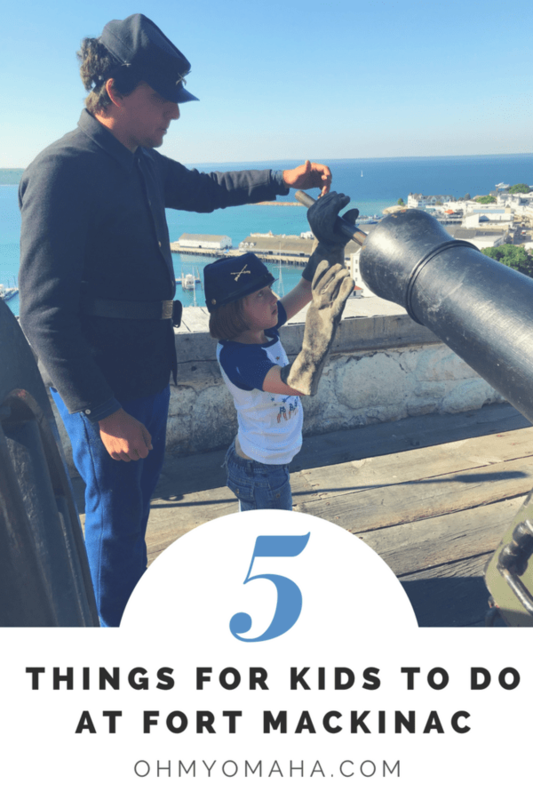 And there’s one place on the island go that combines fun things for kids to do and military history: Fort Mackinac. Disclosure: Mackinac State Historic Parks provided complimentary admission and a complimentary cannon firing session so that I can write about it. All thoughts, opinions and typos are my own. The view from one of the cannons at Fort Mackinac in Michigan. Fort Mackinac is part of Mackinac State Historic Parks. Built in 1780, it served as a military outpost, home for soldiers and their families, and later, was the headquarters for Mackinac National Park. Now, it’s bustling destination for history buffs and families, featuring 14 buildings, costumed interpreters, and possibly the best view found on the island. 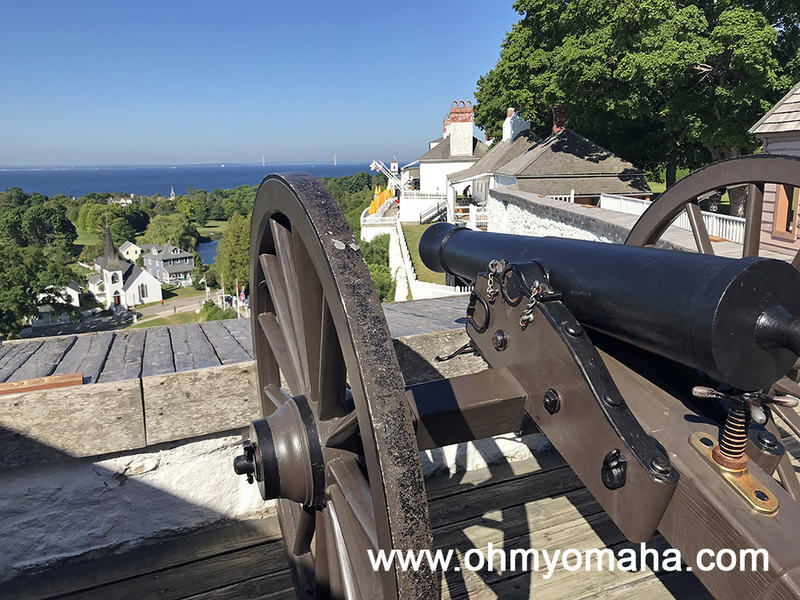 Each morning at 9:30 a.m. sharp, the cannon is fired from the bluff overlooking the City of Mackinac Island and Haldimand Bay. Usually, it’s costumed interpreters doing the daily task, but guests can reserve the chance to fire it, too. 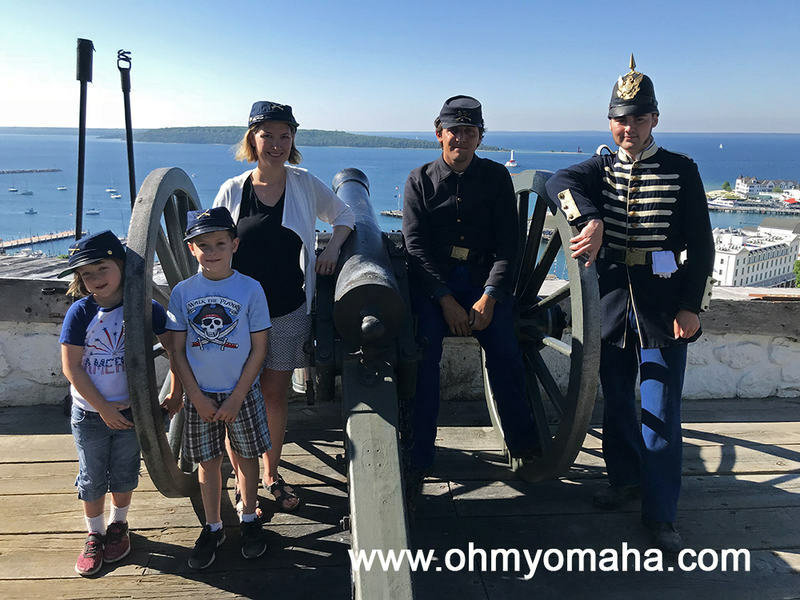 The kids and I got a history lesson while we helped prep and fire the cannon at Fort Mackinac. I got the chance to fire it on the morning we visited, and it was a thrill. It was actually quite a ceremony, and with my kids in tow, we learned a lot. They were too young to fire it–you must be at least 13 years old–but they were old enough to help clean, load and prime the cannon. 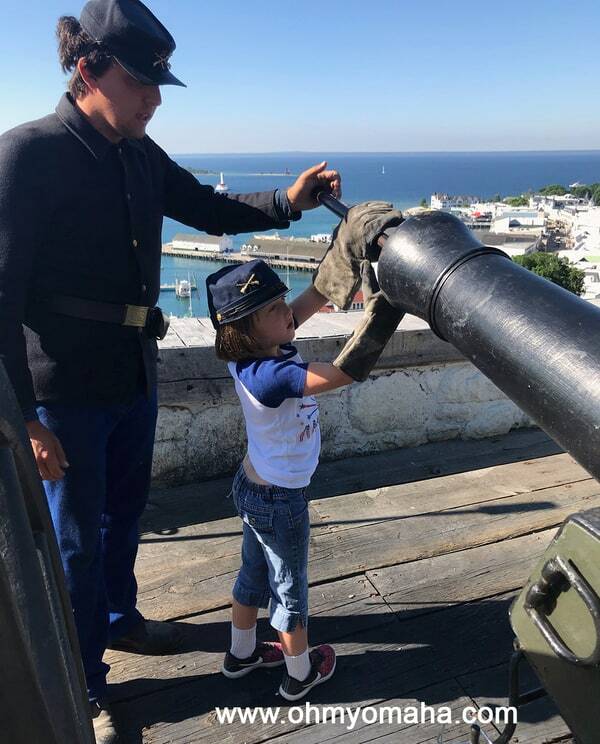 While I was the only one who got to fire the cannon at Fort Mackinac, my kids (ages 6 and 8) were able to help prep the cannon. By far, this was the highlight of our visit, as we felt that we became a part of a centuries-long tradition. It helped that we also got souvenir hats, to boot. The kids wore them for the rest of the day. The experience is $50 for one person, which includes admission into the park and the souvenir hat. Only one person gets to have the experience each day. More details and reservations here. The cannon is fired a couple times a day, but it’s only the 9:30 a.m. salute that could be fired by the guest. It’s one thing to read about history on a sign while you pass through historic buildings. It’s something all together different to hear about history through a character from that era. There are demonstrations performed by costume re-enactors every day at Fort Mackinac. One of the most popular ones is the rifle firing demonstration, which is held several times a day during the summer. 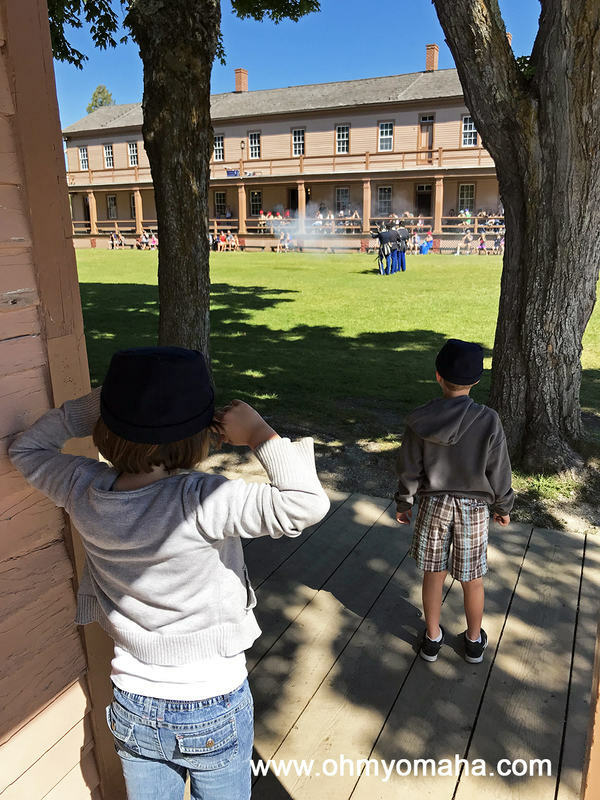 Fort Mackinac has interpreters in the park who regularly perform demonstrations like a court martial, rifle firing, or a bayonet demo. The rifle firing is pretty loud, so be alert and cover ears. It’s not just soldiers at the fort now, just as it wasn’t just soldiers back in its day. 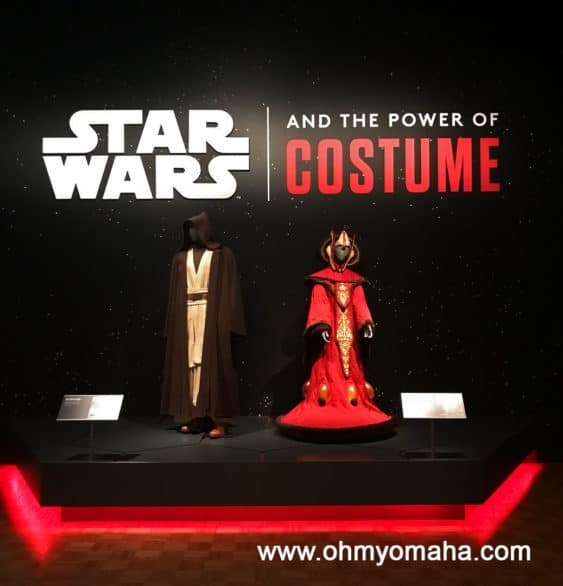 Look for ladies strolling in costume, as well. The Kids’ Quarters is tucked inside the Officers’ Stone Quarters, built in 1780. Here, kids can touch exhibits meant to teach through play. They can pull a cord to fire a cannon, dress up like a soldier, practice morse code, and learn how to carry a rifle. 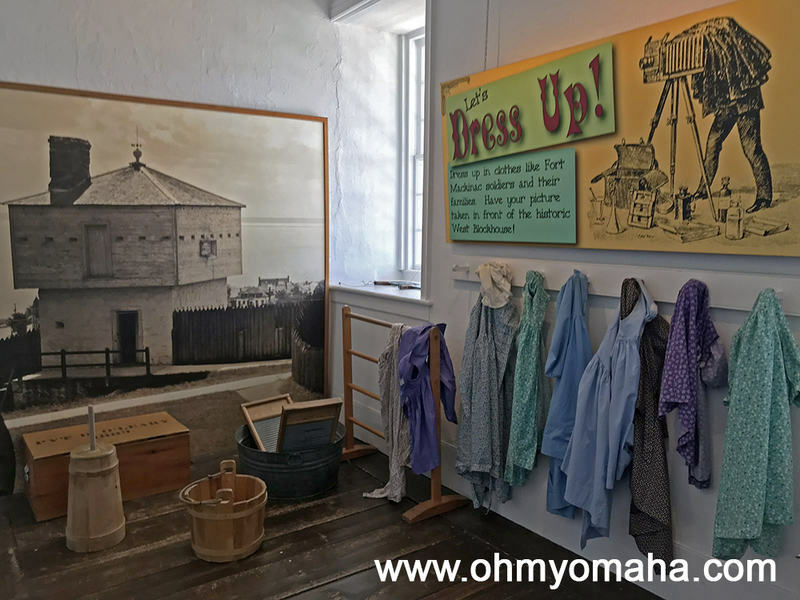 The Kids’ Quarters at Fort Mackinac includes interactive displays like this dress up corner where kids can dress up like soldiers and their families. 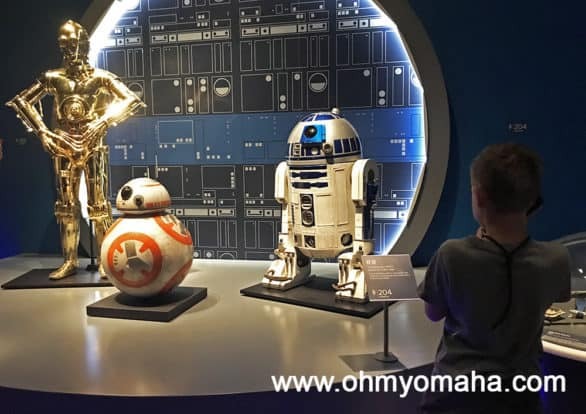 If your kids are under age 8 (probably even under age 10), they’ll like this place. 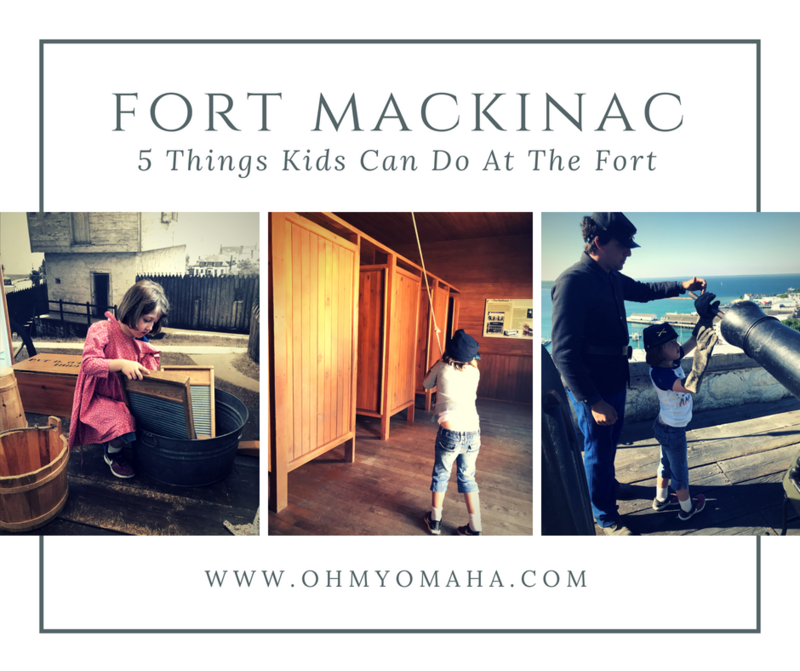 There are more than a dozen buildings to explore at Fort Mackinac. 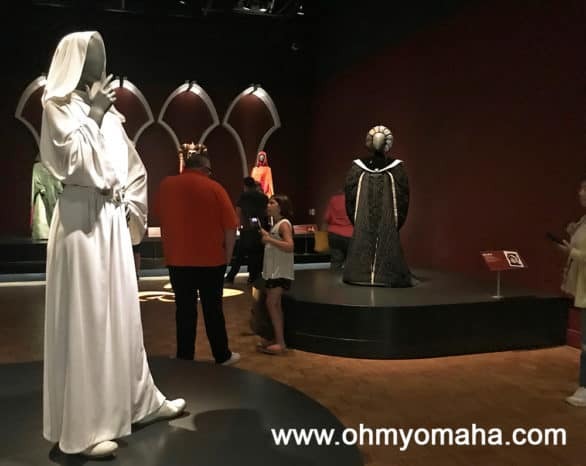 While some keep guests back from the exhibit to preserve items on the display, others are completely open. There are 14 buildings to tour at Fort Mackinac on Mackinac Island, Mich.
Our tour guide pointed out the bathhouse, which dates back to 1885, as an example. Fort Mackinac is also home to the oldest building in Michigan. Use that fact to impress your kids. 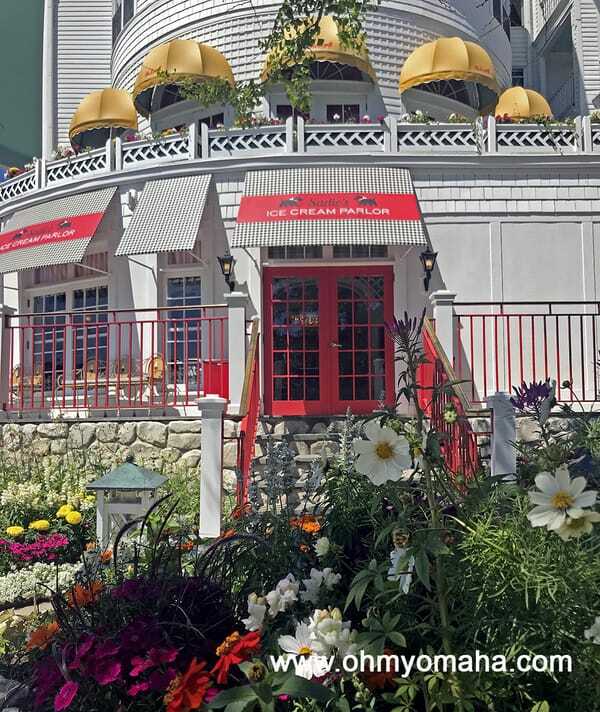 The Tea Room, a cafe operated by the Grand Hotel, is located in Fort Mackinac. Of all the places I had a meal on the island (or in this instance, had coffee), this place had the best view. 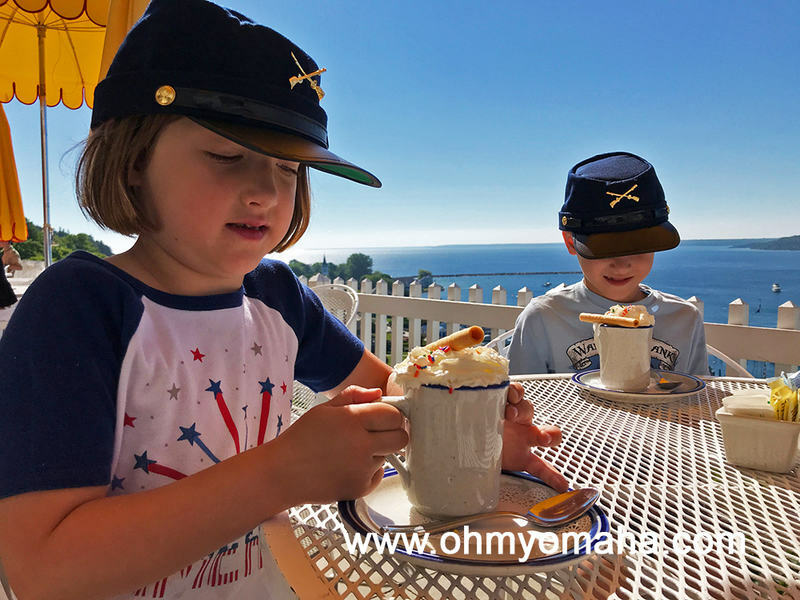 The kids loved the hot cocoa with whipped cream at the Tea Room, located inside Fort Mackinac. The view can’t be beat. 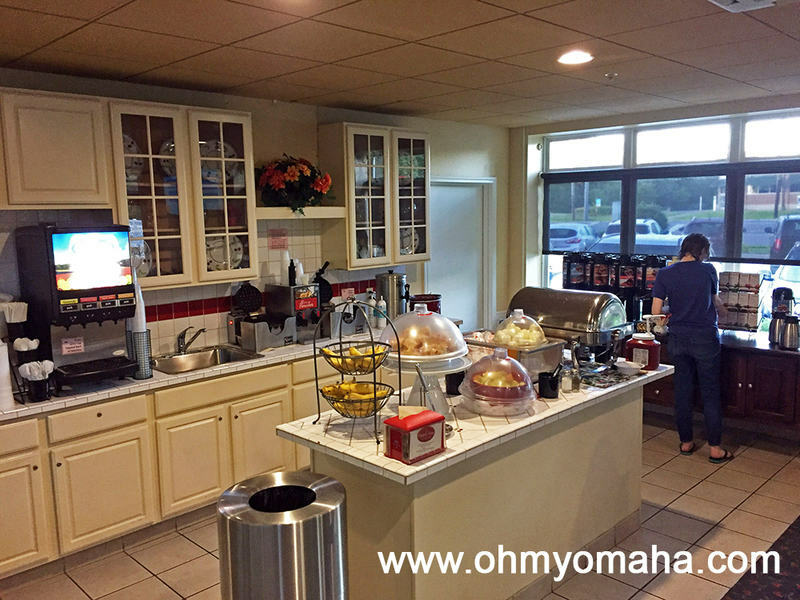 Most of the day, they serve snacks, desserts and beverages. Lunch is available from 11 a.m. to 3 p.m.
Where: 7127 Huron Road, Mackinac Island, Mich. 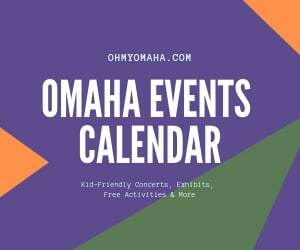 Admission: $13, adults ($12 online), and $7.50, children ages 5-12 ($7 online). Note: Admission also includes The Richard & Jane Manoogian Mackinac Art Museum during the 2018 season and the Historic Downtown Mackinac buildings through Aug. 25, 2018. Your admission into Fort Mackinac gets you into the art museum on the island. It’s housed in the historic Indian Dormitory. 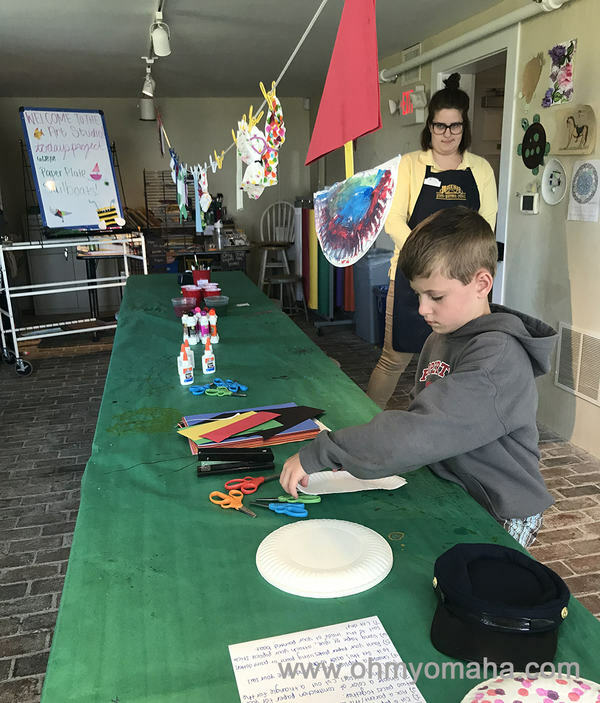 Kids can paint, cut, and draw art inspired by Mackinac Island history at the kids’ studio in the Mackinac Art Museum. 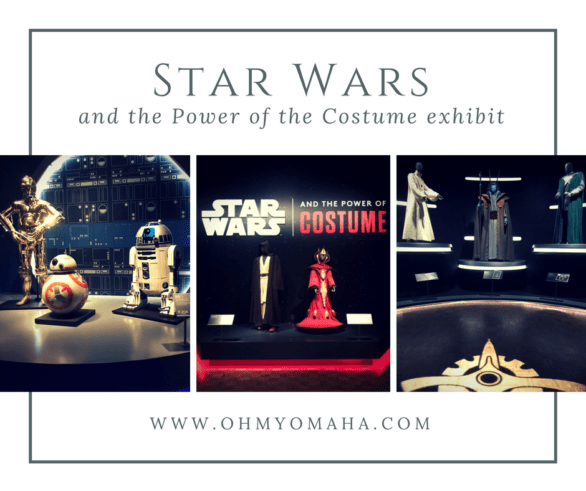 It’s three stories of permanent and temporary exhibits, though we didn’t get to explore much. We spend all of our time in the downstairs art studio. Kids could work on different types of art projects there and either take them home, or hang them up with others. The art studio is only open during the summer. 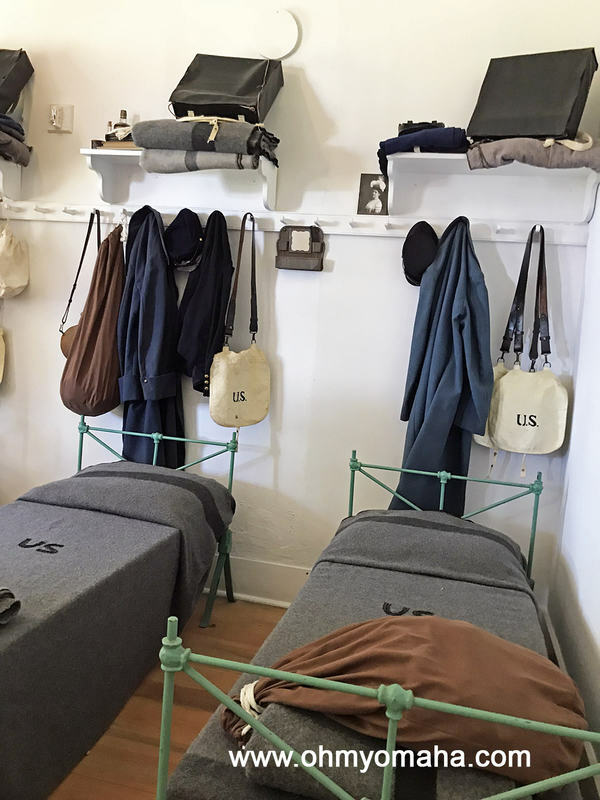 Through Aug. 25, there are four other historic buildings you can tour that are connected to the island’s history as a fur trading depot. Those buildings are the Biddle House, Benjamin Blacksmith Shop, American Fur Company Store & Dr. Beaumont Museum, McGuilpin House, and Mission Church. Mackinac Island inspired an entire road trip through Michigan (more on that to come). To plan your own awesome road trip through Michigan, I’ll be sharing a road trip recap soon featuring restaurant highlights, sights to see, and where to stay. You can start planning now with this ultimate Michigan Bucket List. If you’ve been to Petoskey or a nearby town, you’ll agree: 24 hours isn’t much time to explore things. I know. Yet, we managed to see quite a bit of loveliness in that short amount of time during our summer road trip through Michigan. 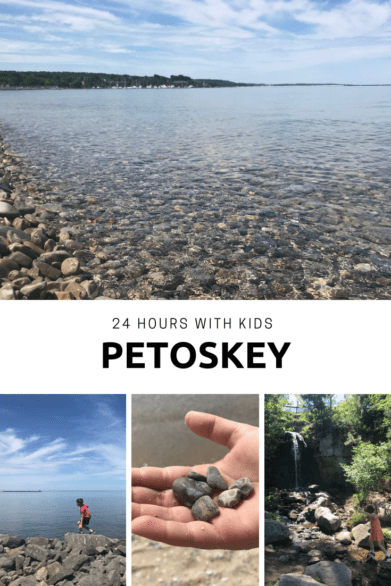 Read on to see all the things you can do in Petoskey if your family only has one day to explore. Disclosure: Our visit was hosted by Visit Petoskey Area. All thoughts, opinions and typos are my own. Our main goal while visiting the Petoskey area? 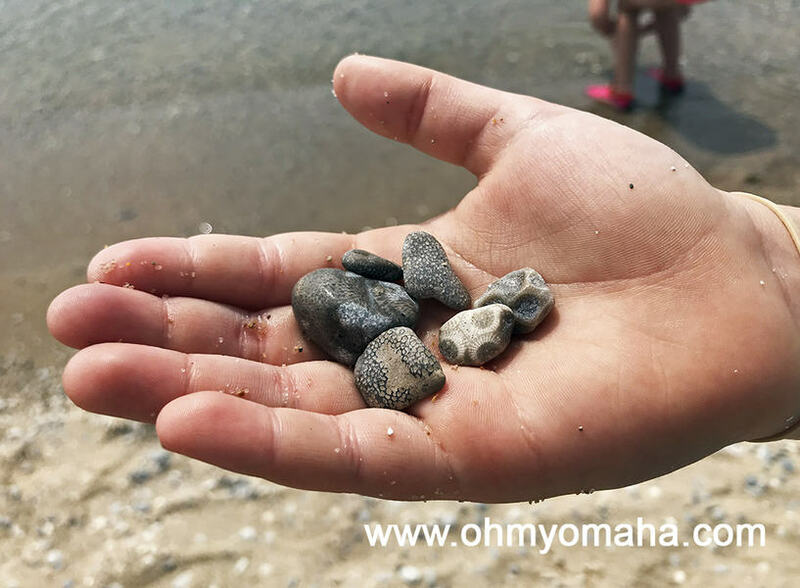 Find a Petoskey stone. It was at the top of my Little Traverse Bay Bucket List. Our second goal: Enjoy the scenery. And my third goal (not quite shared with the family but since they were with me, they had to come along): Find some Hemingway history. We arrived in Petoskey on a gorgeous, summer day. I’m talking blue skies, 72 degrees, birds-chirping-on-my-should kind of day (I might be exaggerating on that last part). The Little Traverse Bay has crystal clear water. My kids immediately began looking for Petoskey stones along the rocky shoreline. We went down Bayfront Park for the view of the lake and immediately my kids started looking for Petoskey stones. The hunt for Petoskey stones begins. No luck. But, lunch called so we gave up the pursuit for a little bit. 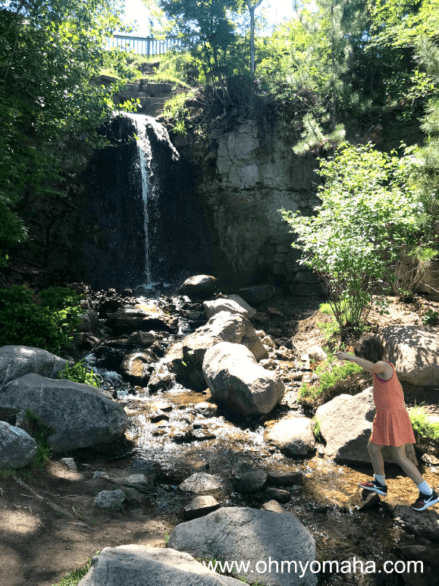 The kids are easily distracted by things like waterfalls. There’s a little waterfall and a creek that winds through Bayfront Park in Petoskey, Michigan. Near the Bayfront Park is Bear River Recreation Area. This pretty little creek runs through the heart of Petoskey and is a great little escape. We walked just a little ways, before moving on (there were Petoskey stones to be found, you know). It’s an easy walk along the trail that runs through Bear River Recreation Area in downtown Petoskey. Our best luck with the Petoskey stone hunt was at Petoskey State Park, which you’ll need a park passport to enter (an additional fee). 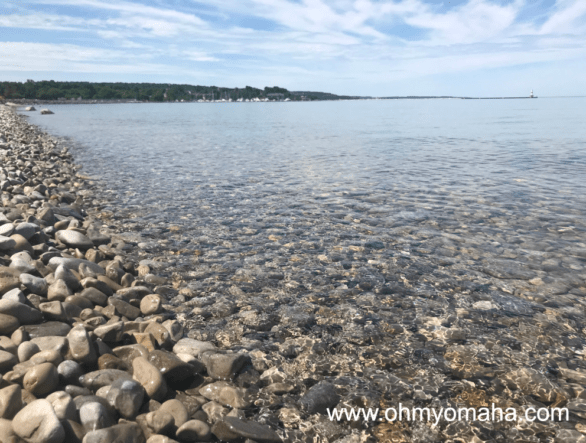 The lake has a great beach area and an abundance of smooth stones washed ashore. We did luck out and found a few beauties! The look of a happy kid, satisfied that he found an elusive Petoskey stone while at Petoskey State Park. The sandy beach was wonderful but the water was frigid, so we kept the stone hunt close to shore. The final place we enjoyed nature was in Alanson, a very small town near Petoskey. Our hotel, Stafford’s Crooked River Lodge, felt removed from everything in a good way. It was beside a river, where if we had time, we could’ve used the hotel’s kayaks to explore down river. This was the entry point at the hotel for kayakers. Instead, we sat on the stone patio, near the fire pit and soaked in the sunset’s reflection on the clouds over the river. Bliss. If spending a lot of time outdoors is not your thing, Petoskey has a charming downtown area that’s full of local shops. Downtown Petoskey has a mix of retail and restaurants. It’s very near the waterfront. Our favorite stop was the bookstore ,McLean and Eakin. The kid’s department there was large. We didn’t have a lot of time to spend in Petoskey, and so, I only have two recommendations. They’re good ones, though. Petoskey has some Ernest Hemingway connections, including one bar that he had visited. You can go there today and sit in his seat, which was the second seat from the end of the bar. The place is called City Park Grill (though in Hemingway’s day, it was the Annex), and it’s in the heart of the very charming downtown area. I was with my family, so instead of saddling up to the bar, we sat at a dinner table and ordered lunch. There is a kids menu, so, it’s totally fine to bring well-behaved kiddos along. 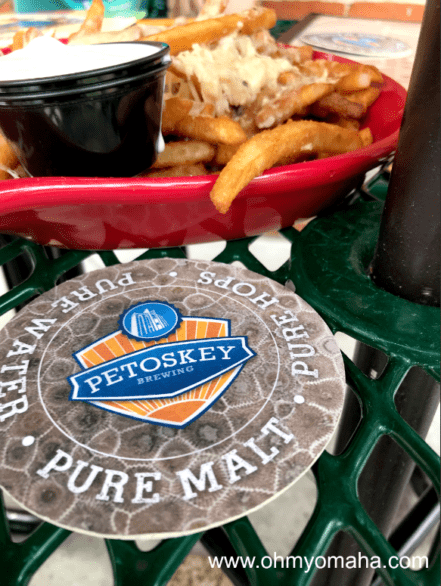 We had parmesan fries, ice cream bars and beer at Petoskey Brewing Co. The brew pup is near Petoskey State Park. Close to Petoskey State Park is our second food recommendation, Petoskey Brewing Co., though we can only vouch for the exquisite, tiny homemade ice cream bar there (and the beer, of course). There are several flavors to choose from, though my family all picked one that involved mint ice cream and Butterfinger candy bars. I dined on some parmesan fries, because that sounded way better food to accompany a craft beer than ice cream. Our hotel, Stafford’s Crooked River Lodge, was about 10 miles away from Petoskey. 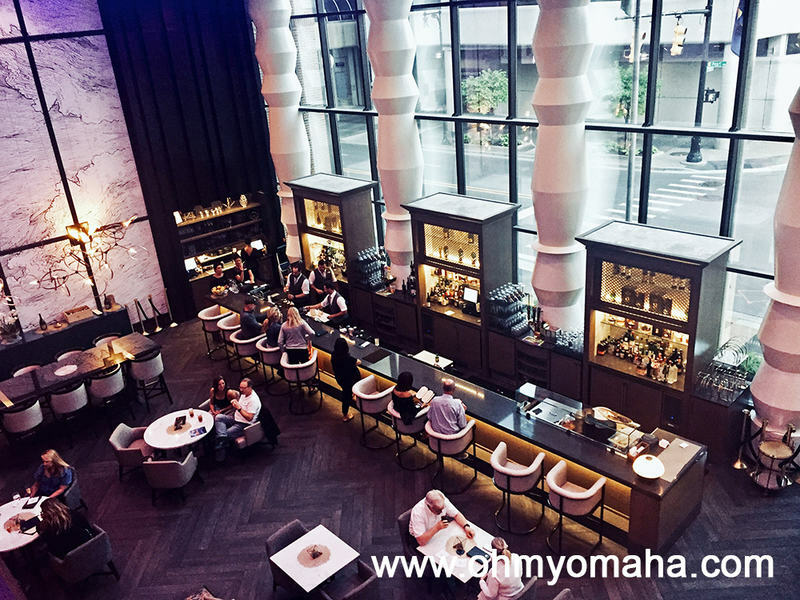 It was a lodge-like getaway without really being too far from modern conveniences like book stores, fancy shops, and microbreweries, then take a look at this hotel. Dusk at Stafford’s Crooked River Lodge in northern Michigan. 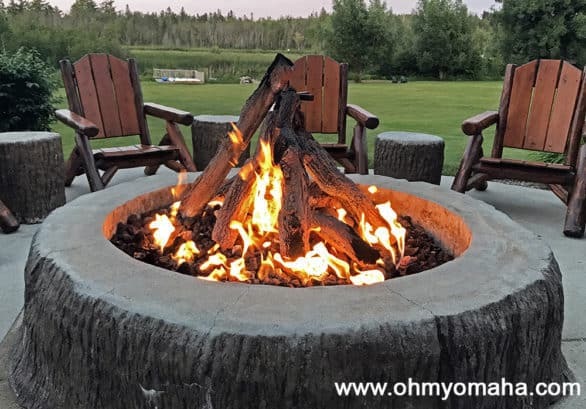 If you look closely, you can see a bit of the fire that was crackling in the hotel’s fire pit. If you’re set on staying in the quaint town of Petoskey, you might want to check out another of the Stafford’s properties: Stafford’s Perry Hotel in the heart of downtown Petoskey. It was built in 1899. Anyway, back to Crooked River Lodge. The room we stayed in was spacious—the biggest on our entire trip. There were two bedrooms each with a king bed, plus a living room area and kitchen. And, then, the best part, there was also a private patio for our room. 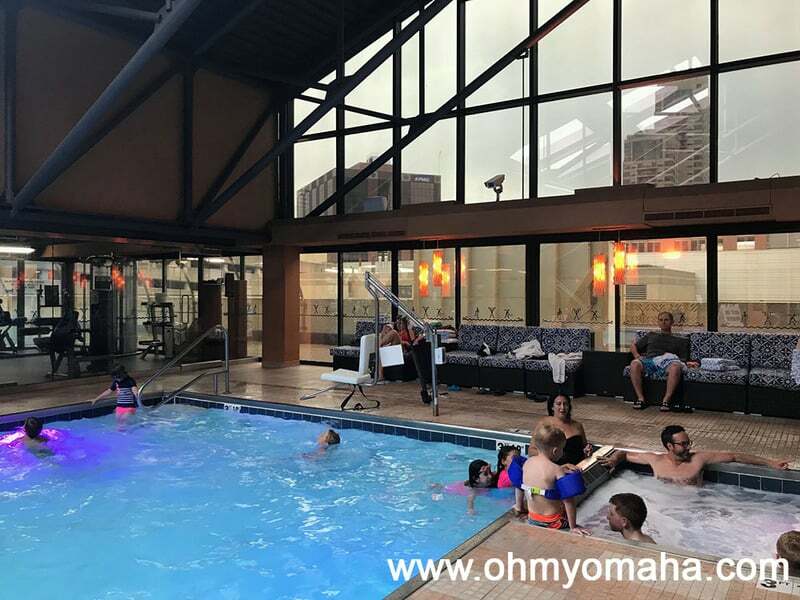 The pool and hot tub were indoors, and included a little waterfall that delighted my kids. The view of the lawn at Stafford’s Crooked River Lodge. Just beyond the lawn is the river. The hotel had lawn games to check out, as well as the kayaks mentioned above. Additional kid-friendly things included a fish pond (with free fish food), hiking trails, complimentary popcorn in the lobby, and my daughter’s favorite thing of all: A little playhouse with toys and a play kitchen. She loved that space almost as much as she loved getting gobs of free popcorn. There is a complimentary breakfast included with the stay. 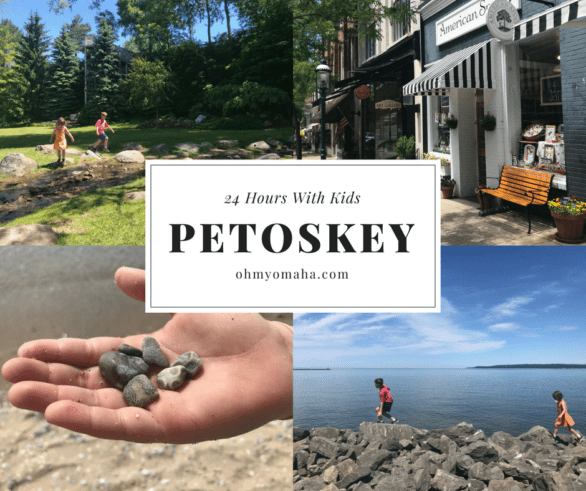 The Petoskey area was in the middle of an epic road trip for my family. 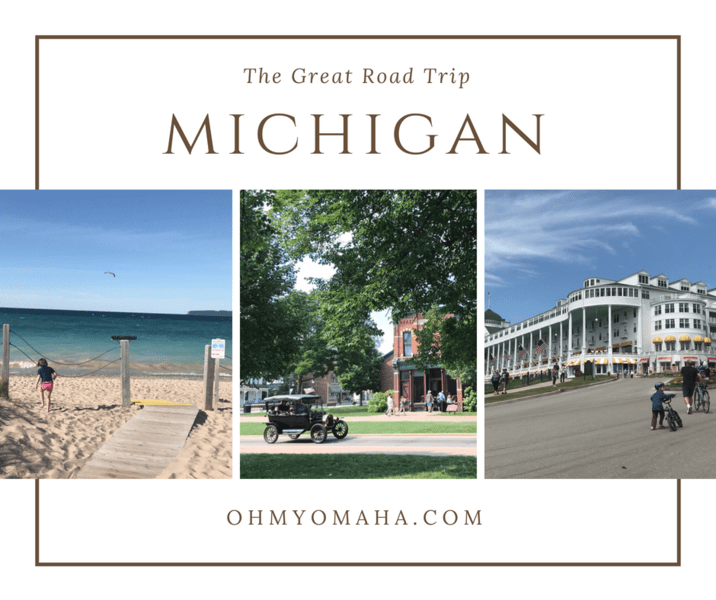 To plan your own epic road trip through Michigan, read my Michigan road trip recap featuring restaurant highlights, sights to see, and where to stay.